Meg Harris (Ozone #27) gets a layout D against Megan Cousins (All-Star Ultimate #17) during the 2015 All-Star Ultimate Tour. Photo by Christina Schmidt of Ultiphotos. 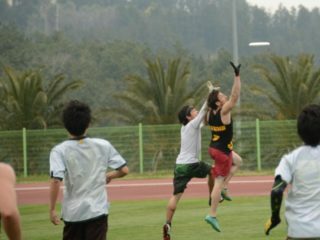 Defense must re-pull the disc if there is no pressure on the first pass after catching the pull. This simple modification can immediately impact the amount of pressure applied to the receiving team. For a handler involved with catching the pull or centering the disc, it adds a level of pressure to find an ideal spot for an easy centering throw. When the defense quickly chases down the pull, the offense often sacrifices yardage for getting the disc into the middle of the field. Your handling core must balance the priorities for your offense. These include getting the disc in or near the center of the field, getting as many free yards as possible, and getting the disc in an aggressive position (i.e. in the hands of a threatening thrower). I like the idea of forcing the handlers into a space that’s not ideal and having to adapt to getting the disc on one of the sidelines. Something that I often run into when coaching youth or college players is that they think they must get the disc centered to a handler in order to initiate the offense. If the disc does not get there, the O-line is stagnant and usually forces some terrible option. 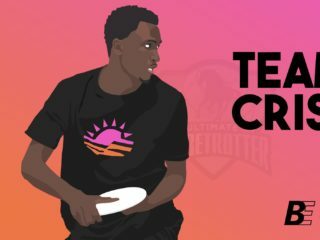 The person fielding the disc should be advancing it to the most creative and skilled handler on the team. The downfield options should be in motion as soon as that person touches it, regardless of where he or she receives it or the amount of pressure placed on the handlers during the pull. In a scrimmage scenario, the O-line is told that they are not allowed to make foul or contact calls. The D-line does not know the O-line cannot call fouls, and is encouraged to play physically (without blatant fouls). The defense should not change the way they play. The idea of taking away the offense’s ability to call a foul forces them to adapt to a physical playing style and play through contact. Ultimately, the O-line will be better physically and mentally prepared to play a physical team. I cannot wait to try this with my college girls. To be honest, they do not call a lot of fouls, and tend to shy away from contact on offense. This would force these young women to adapt to a more physical style of play without shutting down mentally. One variation I would be interested in playing with is to use this “No Foul Calls” idea in a game of 3v3 or 4v4. I anticipate that this variation is most successful when the off-disc defenders play super tight on the offensive players. This variation would surely improve the quickness and footwork of defenders if they play super tight. In a 5-Pull situation, tell the D-line that they are to increase physicality so that they draw at least three foul calls each time the offense has possession. Do not tell the offense anything. I generally love any adjustment that the O-line knows nothing about. I especially like this adjustment because it varies the amount of pressure applied with no predictability. Some matchups might be more physical than others and not every play will have a foul. It keeps the game more similar to the physical style that your O-line might play against in a real game. Another great thing is that it helps teach players who do not make a lot of calls to recognize when fouls should be called. If you’re fouled in practice, you know how to calmly call a foul and engage in a dialogue about the situation. It also forces your defensive players to react to a call in a calm, positive manner. In a situation where some might say you’re setting up an “unspirited” scrimmage, you can have an empowering experience where your team practices how to make neutral calls, have respectful discussions, and apologize or concede when they are wrong. In a normal scrimmage, the D-line is allowed to foul on the mark after four stall counts and the thrower cannot call the foul or make a contact call. This forces your O-line to move the disc quickly. A lot of O-lines have that one player who holds the disc for seven plus stall counts every time he or she gets the disc. This is a very tangible way to incentivize quick disc movement: you get the disc moving in four seconds, or you’re going to get hacked and there’s nothing you can do about it. A team struggling to reset the disc: it forces the reset thrower to adapt and look for a reset sooner, or to throw through or around any sort of mark. A team struggling to set up faster continuation cuts downfield: if cutters don’t push upfield or clear space (i.e. “see the play after the play”), their thrower is going to have a difficult time advancing the disc. *Two of my respondents asked to remain anonymous, so I kept all responses anonymous for consistency. A huge thank you to the people who sent me emails responding about different defensive adjustments they make to increase intensity during their practices. I really enjoyed our online conversations and hope that we can continue to share ideas!